Universal Forest Products Inc. is a holding company that provides capital, management and administrative resources to subsidiaries that design, manufacture and market wood and wood-alternative products for DIY/retail home centers and other retailers, structural lumber products for the manufactured housing industry, engineered wood components for the site-built construction market, and specialty wood packaging and components for various industries. 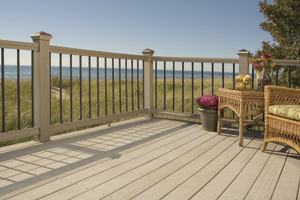 The Company's consumer products subsidiary offers a large portfolio of outdoor living products, including wood composite decking, decorative balusters, post caps and plastic lattice. Its lawn and garden group offers an array of products, such as trellises and arches, to retailers nationwide. Universal’s subsidiaries also provide framing services for the site-built market and forming products for concrete construction. Founded in 1955, Universal Forest Products is headquartered in Grand Rapids, Mich., with facilities throughout North America. The Veranda® products on the following sites (www.verandadeck.com, www.verandadeck.ca, www.verandapremiumfence.com, www.verandalattice.com, www.verandapremiumfencing.com) are manufactured by Universal Forest Products for the Home Depot.